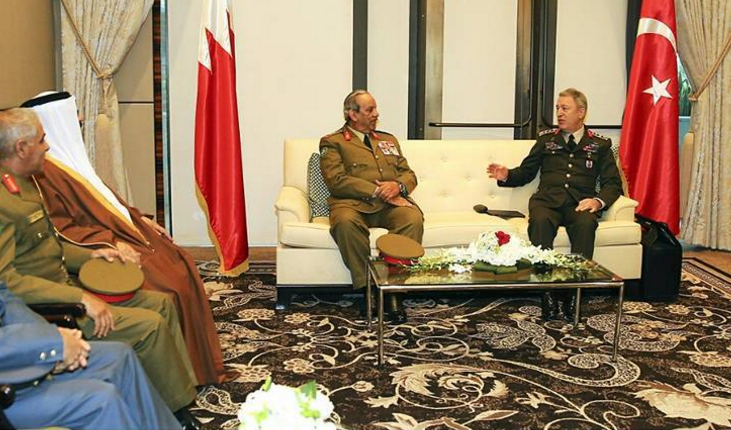 (Manama) – Commander-in-Chief of the Bahrain Defence Force (BDF), Field Marshal Shaikh Khalifa bin Ahmed Al Khalifa, met the Chief of General Staff of the Turkish Armed Forces, General Hulusi Akar, and his accompanying delegation. Defence Affairs Minister, Lieutenant-General Yusuf bin Ahmed Al-Jalahma, and Chief of Staff, Lieutenant-General Dhiyab bin Saqr Al-Noaimi, were present. The commander-in-chief lauded the outstanding Bahraini-Turkish relations, praising the existing cooperation between the two brotherly countries in various fields, including the military industry. Assistant Chief of Staff for Supply and Catering Rear Admiral Youssef Ahmed Malallah, Royal Bahraini Air Force (RBAF) Commander Air Vice-Marshal Shaikh Hamad bin Abdulla Al Khalifa, Director of Military Cooperation Rear Admiral Mohammed Hashim Al Sada and Royal Bahrain Naval Force(RBNF) Commander Rear Admiral Shaikh Khalifa bin Abdullah Al Khalifa also attended.